Return to your favorite Orlando attractions every year with a timeshare at Marriott Grande Vista Resort. Timeshare Broker Sales can help you save thousands on the purchase of your Marriott timeshare resale. Marriott’s Grande Vista Resort in Orlando, Florida is a magnificent oasis located in the heart of Orlando's excitement. As you drive down a private boulevard of tropical beauty, the atmosphere is as warm and friendly as the Florida sun. Cool waters sparkle at every turn, and a tranquil lake stirred by paddleboats welcomes you to embark upon your vacation retreat. This deluxe Marriott timeshare boasts something for everyone and is ideally located in the heart of family-friendly Orlando. Relax and clear away your worries at one of the resort's five separate pools. Enjoy a leisurely stroll throughout beautifully landscaped grounds, or play a few games of tennis on one of 4 lighted Har-Tru® courts. You can even explore the resort grounds with your family on a bicycle built for four! When you’re ready to leave the serenity of your Orlando timeshare, you’ll experience a vacation like no other- amid the world's best known and most incredible theme parks and attractions, sensational shopping, and delectable dining. 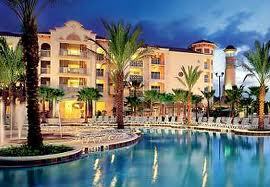 Marriott’s Grande Vista Resort provides owners with access to all of Orlando's most famous and popular attractions. Regardless of whether you’re looking for nonstop theme park thrills or casual strolling through the many shops, this deluxe Marriott timeshare offers proximity to unforgettable experiences, helping to make your Orlando vacation a magical getaway. After a day of memory-making, it feels wonderful to return to your comfortable, spacious and serene villa at Marriott's Grande Vista Resort. This Florida timeshare boasts ample living and dining areas, large enough to provide room for the whole family or a group of friends. Choose the Lock-Off option to give the kids their own space or for privacy when with friends. No matter who comes along, your family's home away from home is ready for your next Orlando adventure. The luxuriously appointed villas at this timeshare vacation club offer one, two or three bedroom choices. All villas come with fully equipped kitchens, plus kitchen bar with counter seating, flat-screen televisions in living area with cable/satellite and DVD player. The master suite offers owners ultimate relaxation with a king-size bed, oversize soaking tub with separate shower, and comfortable furnishings throughout. Finally, fully furnished private balconies and porches allow owners to enjoy that beautiful breeze and tropical scenery from the privacy of their own villa. Become a Marriot Grande Vista Resort owner and enjoy everything sunny Orlando has to offer year after year. There is so much to do and see for you and your whole family in the beautiful Sunshine State. You’d have to work hard to tire of all of Orlando’s attractions, but should the travel-bug bite, your Marriott timeshare affords ultimate flexibility; allowing you to trade your time for time at one of dozens of resorts within Marriott Vacation Club. Further enhancing the flexibility of your vacation property, all Marriott timeshares are affiliated with Interval International- one of the world’s leading timeshare exchange companies. This affiliation allows members to trade their time at their “home resort” for time at one of thousands of resorts all across the globe. With a Marriott timeshare resale, you and your family can experience a lifetime of exciting vacations on a budget. Whether you're looking to buy timeshare or need assistance selling your vacation property, a timeshare resale broker can help you save thousands, secure the perfect vacation property for you and your family, or sell timeshare efficiently and effectively. We can even help individuals rent timeshare when they’re not ready to buy. At Timeshare Broker Sales we have refined the timeshare resale process in order to make it a no stress, hassle-free experience for our clients. Timeshare buyers know they’re getting the best possible deal, hands-on assistance and secure transactions on their timeshare resales; while individuals looking to sell timeshare take solace in the fact that, as licensed timeshare brokers, we never charge an Upfront Fee to list your timeshare for sale- only collecting our commission once your property is sold. This is only one of many factors that set us apart from our competitors and timeshare ad-sites. Because of our knowledgeable staff and insider relationships, Timeshare Broker Sales can help you sell your timeshare as quickly, and safely, as possible. A licensed timeshare broker can provide the hands-on assistance you need for buying or selling your timeshare, rather than simply listing it for sale amid thousands of other timeshare resales. Let us promote your timeshare property on the resale market, or help you find that perfect vacation property! You surely have questions about timeshare ownership. Browse our timeshare basics page, then call one of our licensed timeshare professionals today with any questions about buying timeshare or check out our seller FAQ and contact us if you would like more information about selling timeshare. Timeshare Broker Sales is a licensed REALTOR® and a BBB Accredited Business. We are timeshare resale specialists and Brokers for Marriott Vacation Club worldwide. We have complete inventory of Marriott timeshares in Orlando, Florida, Hawaii, Hilton Head Island, Park City, Palm Desert, and many other Marriott locations worldwide. Call us today Toll Free at (800) 985-9946, and see what our clients are raving about! There is a difference in the hands-on, personalized service we provide! Let us help you buy that perfect timeshare vacation on the timeshare resales market, and see how much you can save. Or, if you need to sell timeshare, we’re here to help you. Remember, as Licensed Timeshare Brokers, there are never any Upfront Fees! Contact us today!